A concise and inspirational book for anyone dealing with pain by a long time palliative care doctor who is greatly inspired by Native American wisdom and the natural world. This book is a celebration of impermanence and what it means to be awake, alive, and connected to the world. The Nest in the Stream is an encouraging and inspiring book for the times we live in. Michael Kearney, a physician whose day job is alleviating the pain and suffering of others, shows that how we live with our pain matters hugely, as it affects our quality of living and our capacity to find healing for ourselves, for others, and for our world. Drawing on engaged Buddhism, the indigenous wisdom of Native American and Celtic spirituality, and the powerful teachings he gained by observing nature, Kearney presents a new model for resilience and self-care. Traditional models of self-care emphasize the importance of professional boundaries to protect us from stress, and time out to rest and recover. 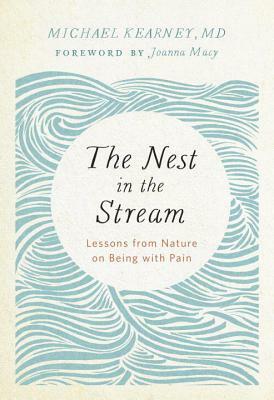 The Nest in the Stream offers a way of being with pain that is infused with mindfulness, openness, compassion, and deep nature connection that encourages us to act for the freedom and welfare of all. It will appeal to those whose everyday occupation involves dealing with pain, such as healthcare workers, environmental activists, or those working on the front lines of trauma, but it will also be of interest to everyone who longs to live in our wounded world with an open heart. Michael Kearney is a physician specializing in Hospice and Palliative Medicine, with over 35 years experience. He lived in Ireland, England, France, and Canada before moving to the United States in 2001. He currently lives in Santa Barbara, California, where he is a founding partner of Palliative Care Consultants of Santa Barbara. Michael Kearney is married to psychologist, meditation teacher, and author Radhule Weininger, PhD. They teach and write together and share six adult children between them.